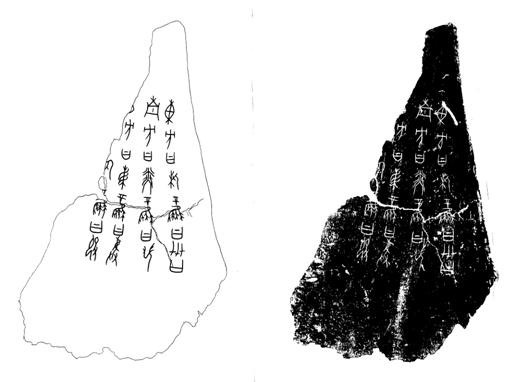 This paper is to restore a Scene Ideographic Character of Oracle Bone（OB）script into its scene they denote (scene-parable telling 說象), and to translate the character of OB script into a suggested character of recent clerical script they look similar in pattern. When the meanings of the suggested character match the meanings derived from the scene of the OB script (sense reading 解意), the suggestion of translation has gained one more semantic support of collateral evidence. The character is imitated to ZTy（transcription），Z as like a fat belly (of a rich) man sit in honest（before Z is read as a slave but a master base on anthropology）, Ty as like a massage gavel in a hand. Z and Ty suggest a third scene of massage or exorcising the pain or demon from body, this is Scene-parable telling 說象. Exorcising or ZTy means destroy (pain ghost), damage (in body), minus or reduce (pain), recovery or renew (spirits). This is Sense reading out or Idea-reading 解意. One of the other way, Ty is殳in recent clerical script, ZTy is translated to 毀 Hui in recent clerical script. Hui character meanings of destroy, damage, reduce, renew in dictionary meets ZTy scene meanings. The choice from many ZTy possible representations or scenes and the translation from many ZTy-look-like characters have got a semantic support of each other. The character is related to the names of the winds (or sayings of wind gods) of the four cardinal directions in OB script at 3000 years ago. 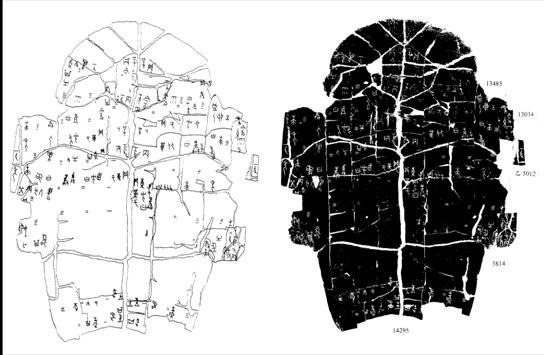 The saying of the north wind god is still preserved in Shan Hai jing (Classic of Mountains and Seas) at 2000 years ago as or 剡 yǎn. When the sound of the suggested character 毀closes to yǎn of the phonetic character剡, the suggestion of translation has got one more phonetic support of collateral evidence.